Those of you who have seen the film ‘The Commitments’ will already be well aware of Barrytown, the fictional suburb chosen as the setting of Roddy Doyle’s first trilogy of novels (the above-mentioned book, ‘The Snapper’ and ‘The Van’). ‘Paddy Clarke Ha Ha Ha’ is also set in Barrytown, but this time further in the past. The story focuses on the life of a young boy in a small village slowly being linked to the city by urban spread and follows him through his daily life. There’s no singing though (well, not much, anyway). Barrytown in 1968 is a very far away place for most of us today. Paddy and his friends roam around in acres of fields, annoying the locals with their antics, fighting, playing football and generally getting into the kinds of mischief young boys (used to) get into. In a small place like Barrytown, everyone knows everyone else, which makes the trouble the boys get into more exciting with the risk of being seen by someone who will tell their parents (which brings back a couple of painful childhood memories for me!). There’s no phone, no internet (!) and very little for the boys to do except wander the streets and fields looking for fun and trouble. Paddy talks about his daily life in the illogical, non-sequential style of a young boy, constantly going off at tangents and coming up with non sequiturs which make you stop reading and check that you haven’t turned a couple of pages by mistake. However, this deceptively simple style, for a while at least, masks the real story here, which is Paddy’s home troubles. As the eldest of four children, he starts to feel responsible for the tension he feels at home and the arguments he hears more and more often. At first, the story appears to be a simple recount of a young boy’s life, but the tale become more and more serious as it progresses. Doyle is a master at using simple, funny, up-beat prose to describe lives which are anything but. He manages to create a confused character who is completely real, neither an angelic, hard-done-to urchin like Oliver Twist or a tough, good-for-nothing street boy. Every time Paddy appears to have matured a little, he’ll do something completely random or lash out at his poor brother. In fact, at times, his thoughts and actions are at odds, as he acts tough to cover the doubt and worry he carries inside. The impression we get from events is that despite being decent at core, Paddy is vulnerable, and his future could be affected enormously by his disturbed home life. My childhood was spent about twenty years after Paddy’s, and, although there were many differences, it was recognisably similar to the one described in the book. I remember playing football in the street, charging around in fields, hurdling hedges in gardens, fighting with friends and strangers, snooping around in abandoned houses and sheds, setting fire to the grass and then fleeing when it got out of control… Now, twenty years on, I don’t think that kind of childhood is possible any more. Parents today (and I include myself in this) are much more cautious and would be loath to allow their kids to wander far from home without supervision. Urbanisation has swallowed up a lot of the land children used to mess around in, and technology has provided more interesting ways for kids to spend their free time. In a society of risk-aversion, it’s rarely possible to grow up in the trial-and-error way of previous generations. So what is this book? What can you expect from it? I would settle on two main ideas. The first is the effect trouble at home can have on a young child just discovering how the world works and expanding his thoughts outside his personal space (something to remember the next time you’re about to have a row with your partner). The second is the passing of the free childhood that most of us remember, and this may not even be something that the writer meant (at least, not to the extent that I have interpreted it). 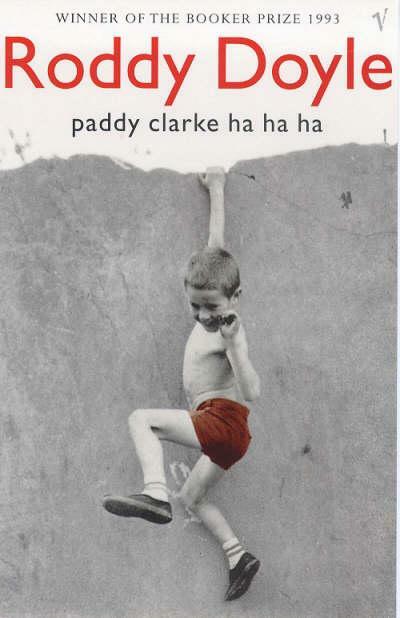 ‘Paddy Clarke…’ was written in 1993. In terms of generational change in today’s society, that really is a long, long time ago; the past can indeed seem like a different country. Thank you! That's actually my second Zombie Chicken Award in the last couple of weeks (I'm not sure what that says about me…). I just bought this book. It's on my "read next" list. Aww..I realized you had that one after I pushed the 'publish' button. Your blog is great, and I love the books you're reading. After reading the first story in Dubliners, I linked to your blog in my short story Monday post.